Uncanny X-Men #15 Review – AiPT! While Marvel Comics’ upcoming ResurreXion relaunch seems to be hinting at a return to 1990s-style X-Men stories, the ‘90s have already returned in the pages of Cullen Bunn’s Uncanny X-Men. If you’re feeling nostalgic, read on to see why this is the X-series for you! Dying in X-Treme X-Men was the best thing that ever happened to Psylocke. Ever since her resurrection, she’s been front and center in the X-Men universe. Writer Rick Remender made some especially strong contributions to her character throughout his Uncanny X-Force run. Bunn clearly shares a fondness for the character as she’s served as Magneto’s right-hand woman throughout his Uncanny X-Men volume. Except – she’s had it with Magneto’s secrets and recently struck out on her own, vowing to keep a close eye on the master of magnetism’s plans and intervene if necessary. As a result, we’re treated to a Psylocke solo adventure. She might be done with Magneto, but Psylocke’s still dedicated to his mission of eradicating threats to mutantkind. So, we’re treated to battles with characters any ‘90s X-Men reader will remember, including Omega Sentinels, Sauron and the Nasty Boys. Any Hairbag fans in the house? 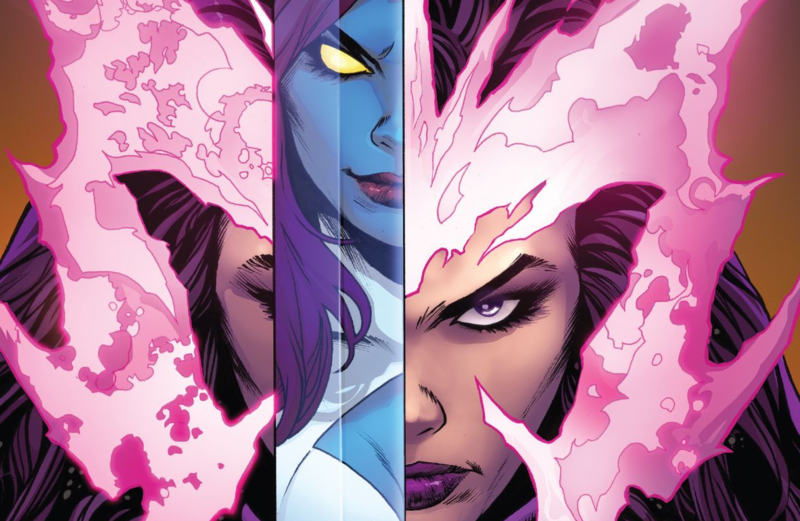 This all culminates with the main event showcased on this issue’s cover – a confrontation between Psylocke and Mystique, whose recent secret dealings with Magneto were a major reason why Psylocke jumped ship. Bunn writes this confrontation between two of comics’ most dynamic women well. There’s no love lost between these two. The battle concludes with a blow that shows just how much Magneto’s ruthlessness has rubbed off on Psylocke. I won’t reveal what happens, but I certainly hope writers don’t abandon it, as it only serves to enrich Mystique as a character. Greg Land and Ibraim Roberson split this month’s art duties. I know Land’s photo-realistic style isn’t everybody’s cup of tea, but there’s no denying he draws a sleek Psylocke. Ibraim’s use of thicker lines does make the change in artist more noticeable, but his capable pencils would be a welcome addition to the revolving roster of Uncanny X-Men creators. I was a big fan of his short-lived Generation Hope run, though his style is a bit different here. Next issue, Bunn’s plotlines crash into the Inhumans Vs. X-Men event, so it’ll be interesting to see how he keeps things moving with characters like Medusa and Karnak in the mix. But considering that he wrote the X-Men’s Civil War II tie-in, which helped lay the seeds for IVX, I have faith in his master plan. Certainly more so than Psylocke in Magneto’s.